Drew Moscona loves to swing and feel the wind on his face. He is a happy toddler who will turn three in a few months, and you would never know that he was born with his stomach in his chest and only a tiny left lung. Erika and Matt Moscona have journeyed a long way. 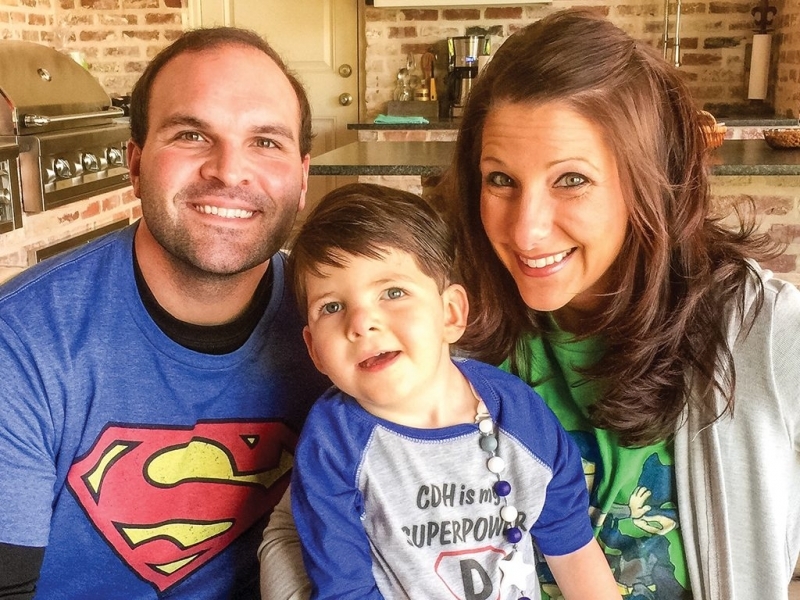 They finish each other’s sentences as they describe how far their little family has come since the diagnosis of a heart problem and Congenital Diaphragmatic Hernia (CDH). CDH is the failure of the diaphragm to form which causes abdominal organs to migrate into the chest cavity. This inhibits lung growth and can endanger other organs. Erika and Matt light up when they describe their miracle. He and his team are working hard to pass developmental milestones. “He does therapy five days a week, occupational, feeding, speech, and physical. We have an amazing team of ladies who work with him,” Erika states. Although “the CDH repair is fixed and all of his organs are back in place, he still deals with the effects,” Matt shares. Drew eats differently than most kids because he has a gastronomy tube (G-tube) that allows him to eat via a pump and feeding bags. Drew is an active toddler, so the Mosconas plan an activity like a walk, drive, or nap during his hour-long feeds. “We try to simplify our life as much as we can so we can have our little normal,” Erika says. For parents struggling with a difficult diagnosis, Erika and Matt both advise, “Ask questions and advocate for your child. There are options out there.” They also want other couples to know that it’s okay for one parent to respond emotionally and the other to take charge. Matt shares that in their marriage they have to be patient with one another because they respond to Drew’s progress in different ways.